Salt can add piquancy to any food. But is there something that can add colour and freshness to this pale edible mineral and enhance its taste? Ask people of Uttarakhand and they will tell you a myriad ways of doing so. “I remember my mother preparing a variety of flavoured salts,” says Vimala Rawat of Clement Town, Dehradun. “We call it pisi loon—salt ground with herbs and spices. And my all-time favourite is daindoosa—a pungently flavoured salt made with mustard seeds and chilli. In winters, she used to spread ghee on chapatis, dust them with daindoosa and offer us as rolls. In summers, she would sprinkle it over fruits to prepare chaat,” recalls Rawat. 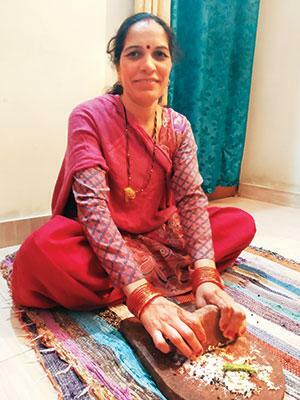 In fact, says Rekha Kothari from Dehradun’s Shivnagar locality, most people in the region use pisi loon as a relish with mandua (finger millet) ki chapati or rice. Every day after finishing household chores, Kothari returns to her sil-batta (grinding stone) to prepare pisi loon of varied flavours. While earlier, she used to prepare it for her family, these days she supplies it to stores catering to its growing demand beyond the hills. This is the Instagram handle of Kothari whose flavoured salt has reached the international market through Mahila Navjagran Samiti (MVS), a non-profit in Dehradun. “MVS supplies the raw material and pays me Rs 100 for preparing a kilogram of pisi loon. This has not only added to our income but has earned me respect. Several others now approch me for pisi loon,” she says. In nearby Haldwani city, Rakesh Joshi and his wife Kiran run a self-help group that prepares 10 varieties of flavoured salt. “We had exhibited the products at a recent fair and received good response from people. Hara namak, a mix of green coriander, mint and garlic, was the fastest selling one,” says Kiran. Realising the potential, two online retailers have started selling flavoured salts. While Paharivirasat sells bhaang (Indian hemp) ka namak and lehsun (garlic) ka namak, Ejaafoods deals with four flavours. Birendra Matiyali, co-owner of Ejaafoods, says to ensure livelihood opportunity to village women through this traditional culinary art, they have joined hands with Himalayan Flavoured Salts (HFS), a venture in Kakrighat village along the Khairna-Almora Highway that sources its herbs and spices from women farmers in nearby areas. “Lakhori yellow chilli salt is made from a chilli native to the hills, and is named after a village Lakhora in Almora district. Since we have started procuring it, the chilli is being grown in villages near Nainital,” says Deepa Khanayat Negi, the brain behind HFS. “Women in nearby villages have started growing mint, coriander, ginger, garlic, sesame seeds, bhang seeds and bhangjeera spice following our demand. We directly buy the produce from the farmers so that they save on the transport cost,” quips Negi. Taking a step further Ejaafoods is now exploring whether to sell products made of packaged table salt or those made of rock and sea salts, which were traditionally used in pahadi cuisine. “Since packaged salt is easily available and comes in powdered form, most people prefer using it in pisi loon,” says Matiyali. His concern stems from studies that say rock salt comes loaded with micronutrients. Himalayan pink salt contains 88 micronutrients and using table salt denies the user of these benefits. Processed, packaged salts lack these micronutrients. As the jury’s still out, Rawat suggests consuming freshly ground pisi loon with unprocessed salt. It not only gives the condiment a coarse texture but also enhances its aroma. Roast mustard seeds on a flat-bottomed pan over medium heat till they splutter. Let it cool. 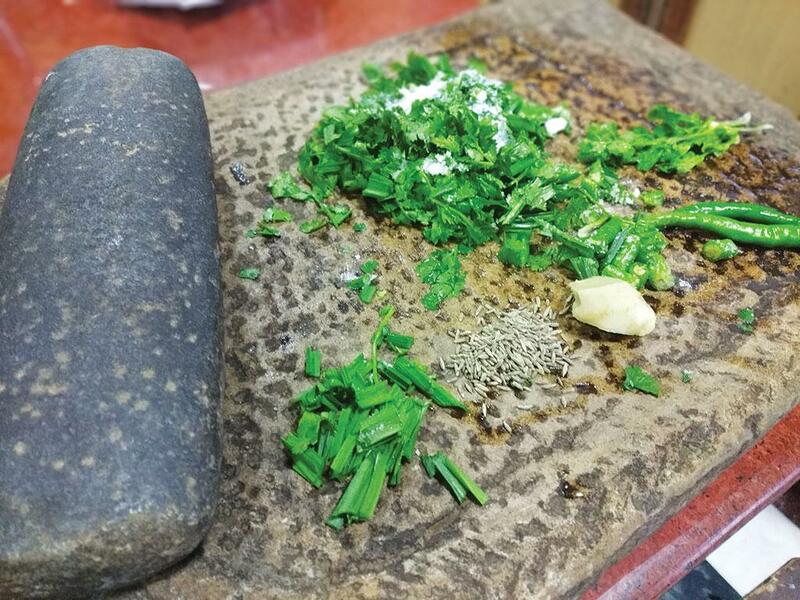 Grind it with the other ingredients on a grinding stone. Store it in an air-tight glass jar. Serve along with ghee as an accompaniment to rice or chapati. Grind all ingredients together. The paste can be spread over cucumber and other fruits to prepare chaat. It can also be dried in the sun and stored for a month. Mix it with ghee and serve with rice or chapati.